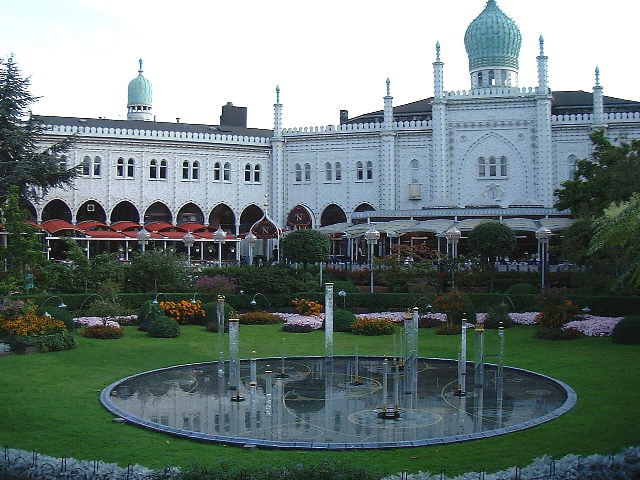 Tivoli Garden, is a famous amusement park in Copenhagen, Denmark. The park was built by Georg Carstensen, the well-travelled son of a diplomat, and opened on August 15, 1843 . Except for Dyrehavsbakken in nearby Klampenborg, it is the oldest amusement park which has survived intact to the present day. The gardens have 25 rides, 28 restaurants, 110,718 outdoor lights, 134,000 tulips and narcissi, 876 trees, 6,200 m2 of water, and 20, 679 m2 of buildings. Tivoli was inspired Orient style as well as by the 'pleasure gardens' in Paris and London the previous century.